Most of us could benefit from improving our eating habits but menopause is one of the best times to evaluate your diet and make changes, all of which can support the menopausal transition. During menopause, your hormones – oestrogen and progesterone – begin to decline, leading to a number of physical, mental and emotional symptoms. Women who eat a poor diet may find that during menopause, they really begin to see the effects of their choices. If you are ready to begin eating to support a healthy menopausal transition, then it's important to become educated on the basics of healthy eating. Fats still have somewhat of an unfortunate reputation when it comes to diet. There are, however, fats you can choose that provide health benefits. By avoiding saturated fats whenever possible, you can reduce your risk of diseases such as heart disease. It isn't as complicated as you may think to make subtle tweaks to your diet. You can replace butter with a lower fat margarine and use skimmed milk in place of full-fat dairy. You can also choose meats that are leaner and be sure to trim any excess fat. 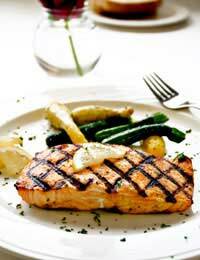 Choose fats that are beneficial for your health, such as those found in oily fish. These kinds of fish include salmon and mackerel, among others. They are all thought to improve heart health and may reduce the risk of diseases such as diabetes. If you follow good eating habits, you don't have to lose the enjoyable taste of fat. Instead, substitute healthier fats by using products such as olive oil, which can also keep your body healthy and skin soft, particularly as your loss of oestrogen can leave skin drier than usual. Every healthy diet during menopause should contain adequate carbohydrates. Aim for whole grain breads and cereals. Eating several servings of vegetables can also positively contribute to your carbohydrates each day. Carbohydrates such as refined products, including sugary treats and cereals or white bread should be limited and replaced with whole wheat products whenever possible. If you love your white bread, however, try to consume a mixed one that is half-white and half-brown. Protein is important for supporting a healthy body that is resistant to disease as well as for building muscle mass. Protein is generally sufficient in most British diets, but the type of protein is not always the healthiest. Protein in fatty meats comes alongside saturated fats. Choose lean red meats, chicken, seafood, dairy products, soya foods or pulses to ensure you obtain a healthy intake of protein foods. As a general rule, eating a varied diet is the best approach because it ensures you enjoy a range of foods, all of which will have different profiles of vitamins and minerals. Try to eat lots of fruits and vegetables, which can help to maintain energy while supplying antioxidants to combat disease. Supplements are not a replacement for a healthy diet, although they can be used as a support measure in people who require it for various health reasons. Aim to include five or more portions of fruits and vegetables each day. Nuts such as almonds, walnuts and brazil nuts can also supply vital minerals for good health. Food is an enjoyable part of life but poor food choices can lead a lower quality of life as well. During menopause, your bodily changes can mean that you need to ensure you eat a healthy diet that incorporates a range of nutritious foods. You can still enjoy treats once in a while, but try to make the majority of your diet one that includes fruits, vegetables, nuts, lean protein sources and healthy fats. Your menopausal body can transition more comfortably and you will look and feel your best.